Would YOU store YOUR specialized stamps this way? 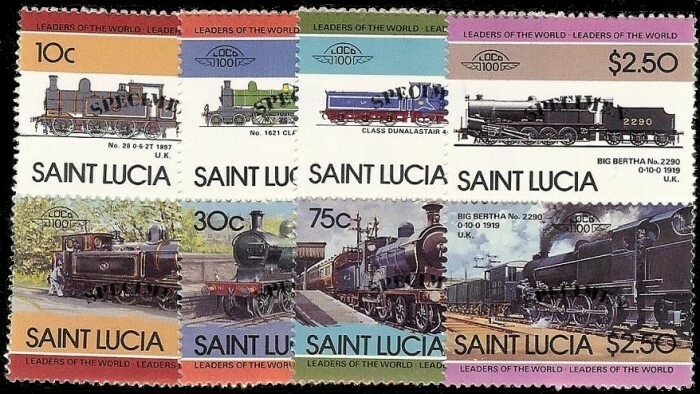 In 1983 Saint Lucia joined other commonwealth countries in the production and issuance of the Leaders of the World (LOW) Automobile and Locomotive series of stamps. 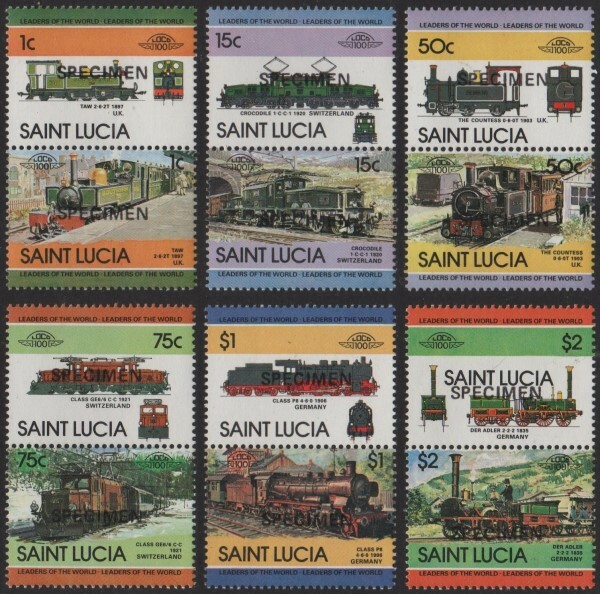 Between 1983 and 1986 Saint Lucia issued 4 sets of the Automobile series and 5 sets of the Locomotives series. This page will try to clarify how many sets were issued and produced and what varieties were also produced. We will show examples of the varieties including progressive color proofs, specimen overprinted varieties, imperforates and yes the made for collector errors and where possible, genuine errors. There was a huge controversy on the legitimacy of the production and sale of the varieties which ended up in court trials against the owners of the Format International Security Printers Ltd. and associated companies, their owners and some employees. The trials proved that the companies and owners had the sole right to reprint, and produce the varieties at their discretion for promotional programs and such despite the objections of the Tuvalu Philatelic Agency and others. A large portion of the progressives and other varieties were seized as evidence for the trials by the British Metropolitan Police and held by the same until 2008 when they were finally released back to the original owners. See the above image as an example of the cruel way the material was stored. We are lucky it survived! Representatives for Tuvalu went through the material and confiscated some for destruction but much was left and now these varieties are available to the collecting community to add to their topical and specialized collections. 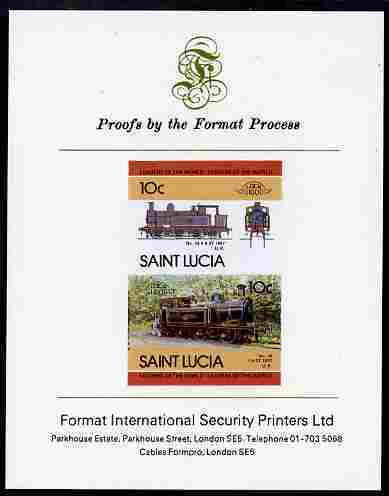 As for the material from St. Vincent, St. Lucia etc;, it was released back without tampering. The valuation of the material has been grossly under valued because of the stigma produced by a few agencies, clubs and ex-employees and some dealers over the past 20+ years instilling in the collecting community the idea that there are "millions" out there hidden away in warehouses, attics etc. This is NOT the case and with the evidence I now have, I can now show this to be a huge exaggeration on the facts. 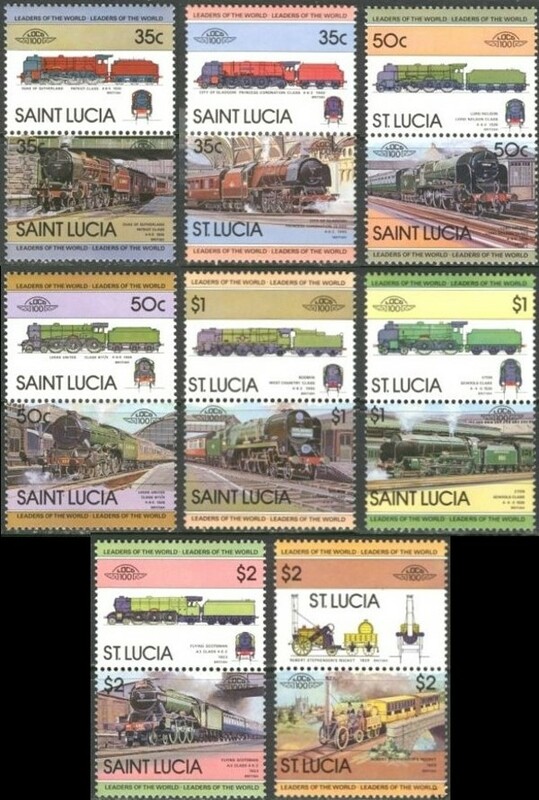 I will present each set as it was issued and show examples of some of the varieties. Either I have exact documents proving what was produced or I will use existing documentation which shows the general practices used for ordering and printing of the varieties which shows the general consensus of quantities produced and if possible...what still exists. As (and if) more information and documents are discovered, it will be added to this study for reference to collectors. Through evaluation of the documents I have in my possession and the common practices of the printer, all sets of LOW Cars and Trains fall under the same consensus of quantities produced. 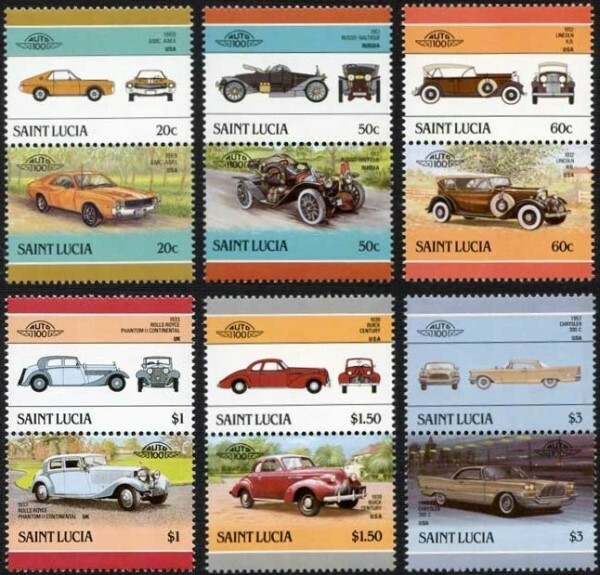 We know that all issues for Saint Lucia were reprinted ONCE except possibly the final Automobile series as there appears to be no varieties available anywhere for them. The standard was the same for all that 21,000 normal sets were reprinted for the PDC. 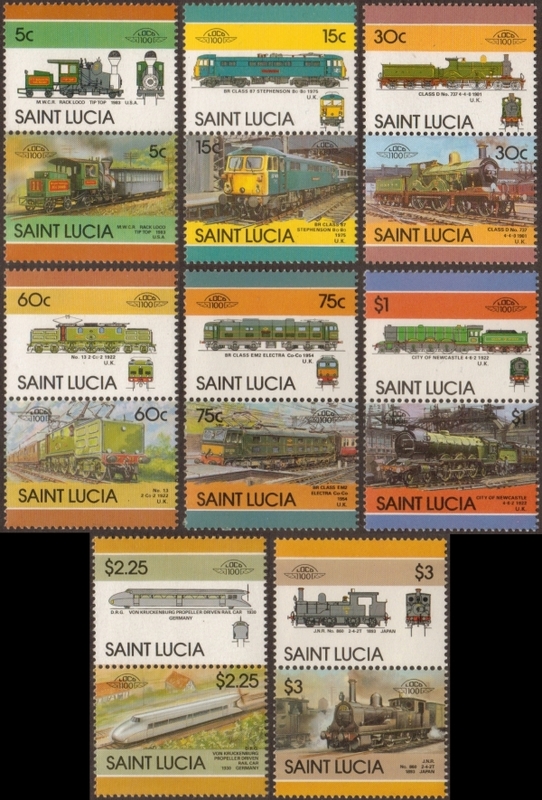 General invoices and documents show that orders for many stamp sets outside the Leaders of the World Series and including the LOW series as well ranged from 15,000 to 25,000 sets for Saint Lucia. 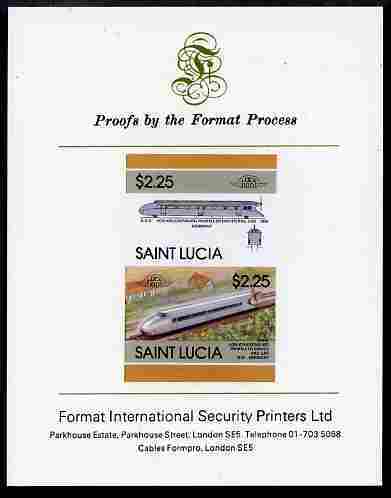 At that time the PDC had a set allotment printed for resale via outside stamp selling entities. The allotment was generally 2/3 of the given original orders. 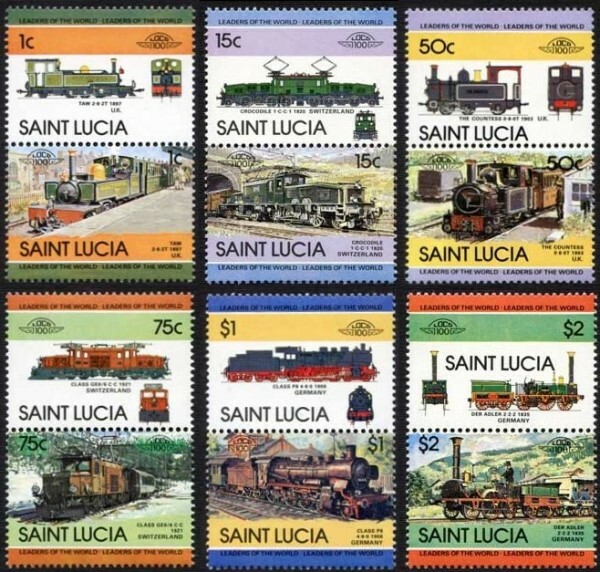 The calculation of 21,000 for Saint Lucia appears over and over and is an easy quantity to break down for the allotment. 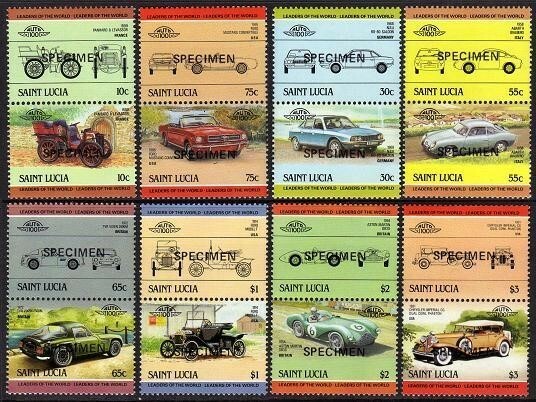 21,000 went to the Saint Lucia Philatelic Bureau and 14,000 went to the PDC's outlets. 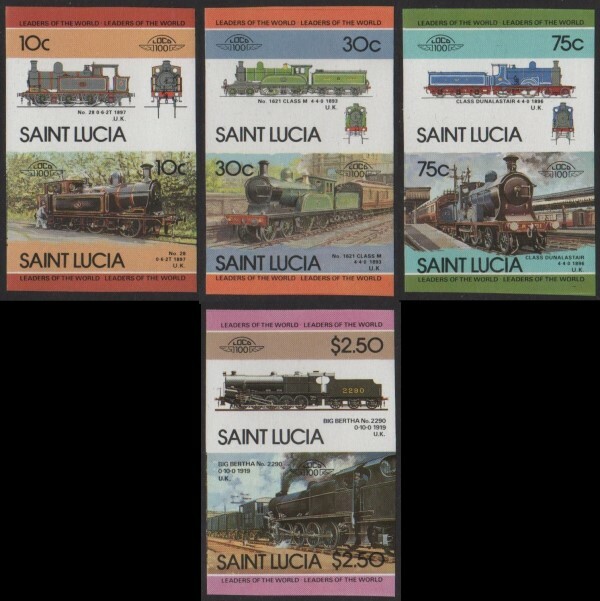 So I will base on the higher figure that a total of 75,000 sets were produced for Saint Lucia. I show basis for this below. There is a difference with Eastern Hemisphere countries as there was also an allotment of the regular issued stamps that was added to the issues sent to the PDC. These were called "GOOD OVERS" which was a supplemental stock or extra number of sheet runs (possibly to compensate for any errors) in the main run of reprints. Here are examples of these invoices. 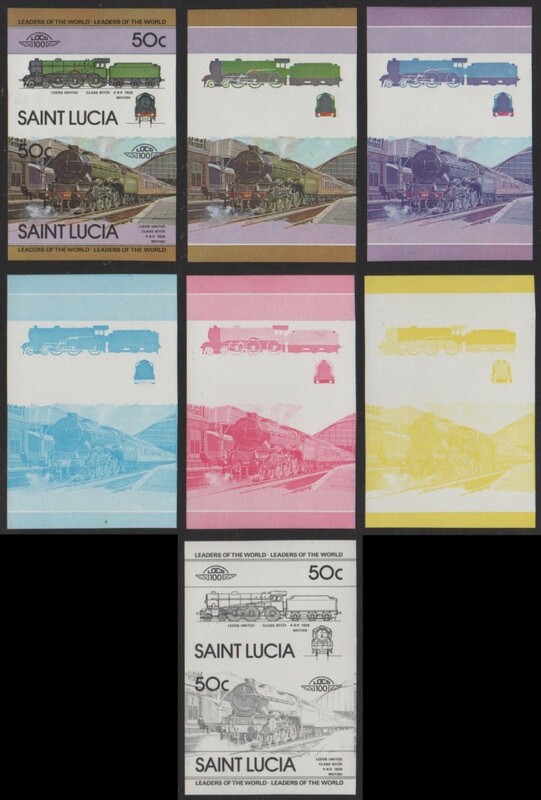 These two invoices are for the St. Lucia 1985 locomotives 3rd series low values. This is evidence that statements that only 10 exist of the imperforates etc; are to be questioned. Most all specimen overprinted stamps, Imperforate stamps and errors were all printed at the time of reprinting as allowed by the "reprint agreement". Therefore all of them have finite numbers. 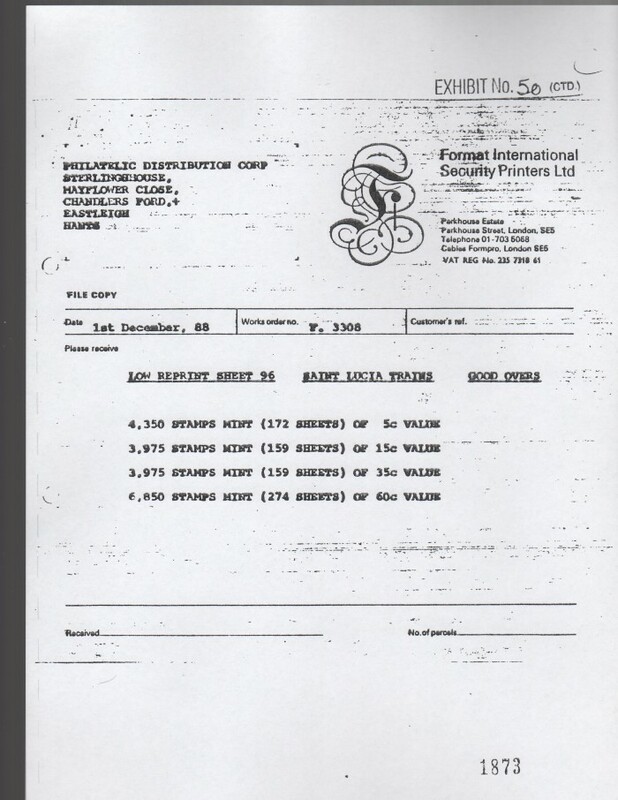 With Tuvalu it was agreed to allow them to confiscate what they deemed as errors. Progressive color proofs are not errors but they confiscated and destroyed many of them before they could be saved. Most all imperforate specimen overprinted sets and quite a few imperforates and even some of the normal specimen overprinted sets were also taken. I do not know why they did not take all of them but theorize that because the evidence taken was so large, I am talking about many thousands of panes, that they just simply missed them. 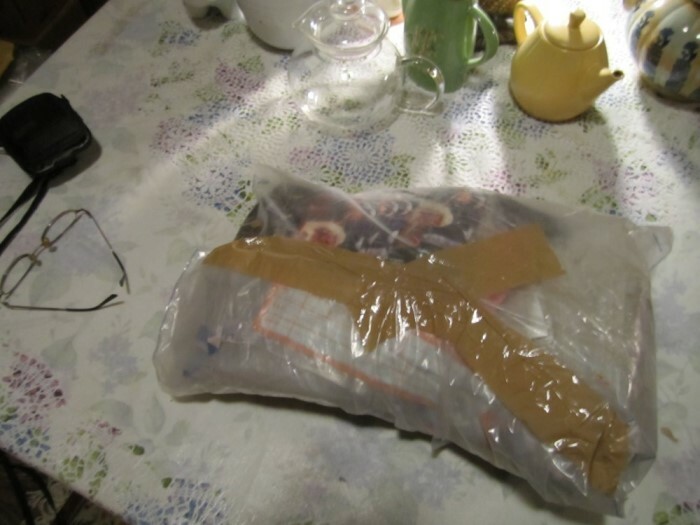 The evidence was just thrown into police evidence bags with no regard to the philatelic preservation what so ever! Thus sorting through the material was quite difficult. Again view the example shown at the top of the page. Try sorting through several hundred of those! 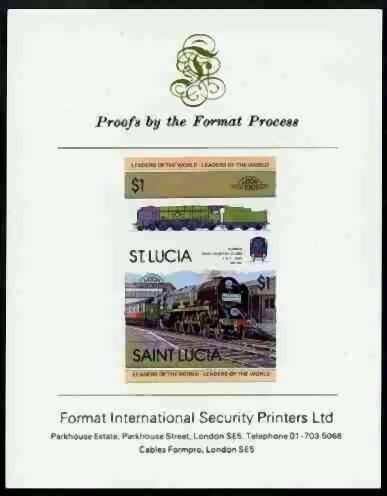 For Saint Lucia all material was retained and given back to the owner. Sadly because of the poor storage the main crate containing the Saint Lucia varieties was water damaged. Some of the progressive color proof panes and other varieties were completely destroyed whereas some were damaged on the edges or only a few stamps on the pane were damaged. Much was NOT damaged luckily so we have them today. The material has proven invaluable in that all of it was there thus we were able to define many quantitative numbers that were printed thus solidifying proof of what was printed. The basic numbers fall directly in line for St. Vincent and Dependencies and Nevis as well. 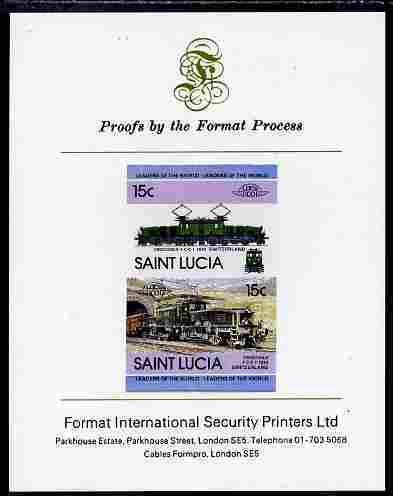 Based on documents and the St. Lucia holding we can solidly affirm quantities even though the Saint Vincent/Nevis side was auctioned off in bulk and subsequently placed into random lots and scattered around the world! 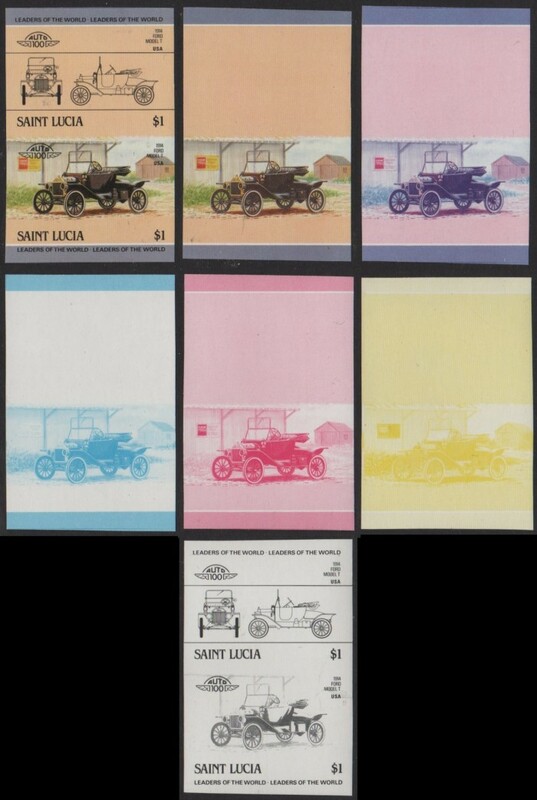 Many of the progressive color proofs on the St. Vincent side may never be reunited with their counterparts because of the way they were sold off for quick sales. 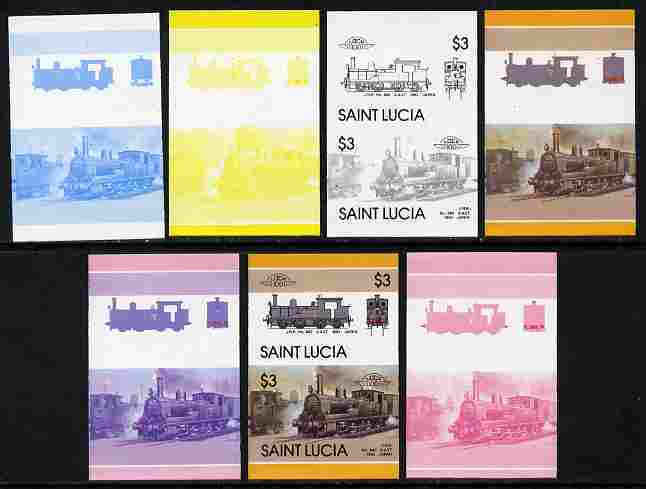 I on the other hand have done the work and organized and counted all the St. Lucia and Tuvalu side and it will be sold in an organized and knowledgeable manner. I have obtained some of the progressive color proof panes involved in the making of the errors on the St. Vincent side. It really was a quite simple process of splitting a color into two different panes and then not running one of the panes through the full printing process thus creating the error of missing color. This technique was a little bit more advanced than the method of just not using a full color in the process and produced some interesting novelty errors such as pink trains etc. The production of made for collector errors for the LOW Automobiles and Locomotives series was not as massively produced as some articles and rumors would like you to believe. 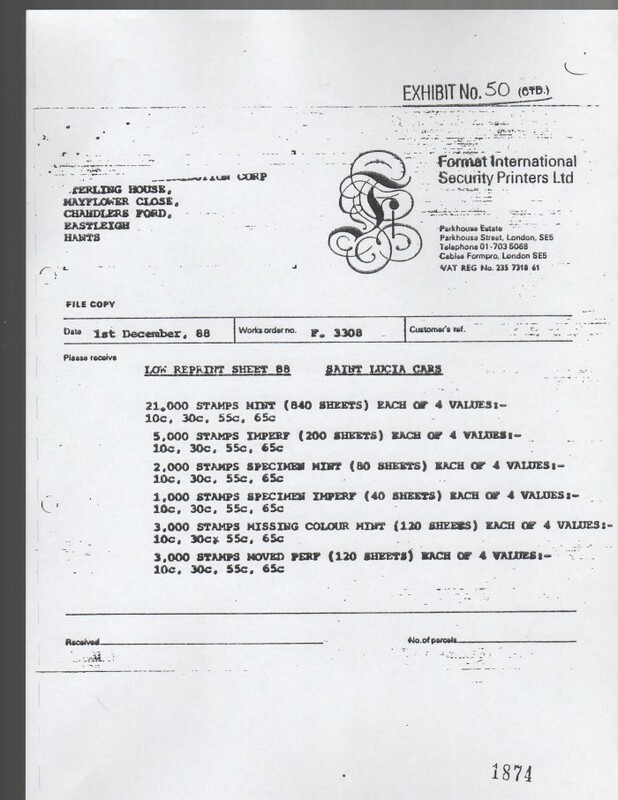 Yes, if you study the documents you can see that the four values on the uncut press sheets were ordered but with the release of the Saint Vincent and Nevis side of the police evidence we are now finding that apparently only one value was actually saved from the big sheet runs in most cases. 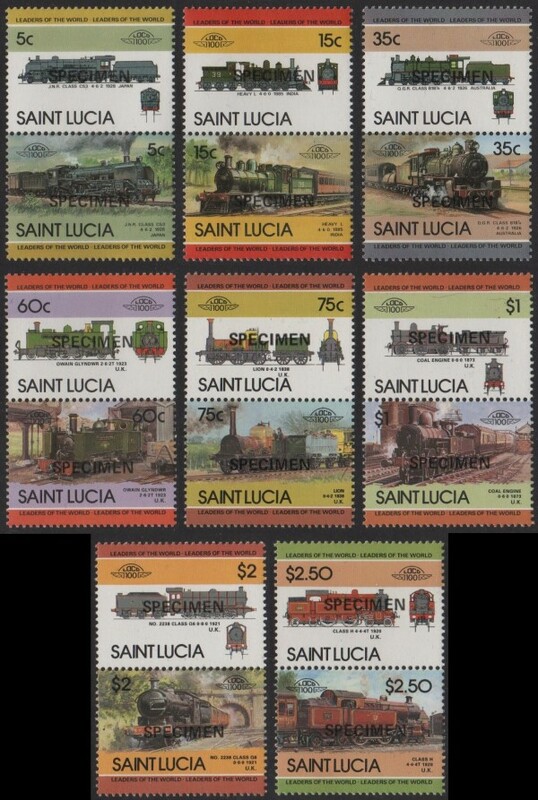 There are a couple series from the 1986 sets from some of the Eastern Hemisphere countries that appear all four values or most of them at least were saved. We base this on what has been found available on the internet. As far as the misperfed or shifted perf varieties, very few are on the market leading us to believe either most were destroyed or they possibly are stored. One of the purposes of these pages is to show the numbers produced so if at any time in the future any appear, collectors like you and me will know that they are NOT great rarities and one should not pay out a lot of money for them. $1-5.00 is all they are worth and only as a novelty or as an interesting addition to a collection. I would also like to note that evidence shows that stamps with missing denominations and or country names are not made for collector errors at all! They had a purpose. Again in error they were added to the over exagerrated numbers of "errors" or "funnies" as some call them calculated by the articles and rumors spread to the collecting community. 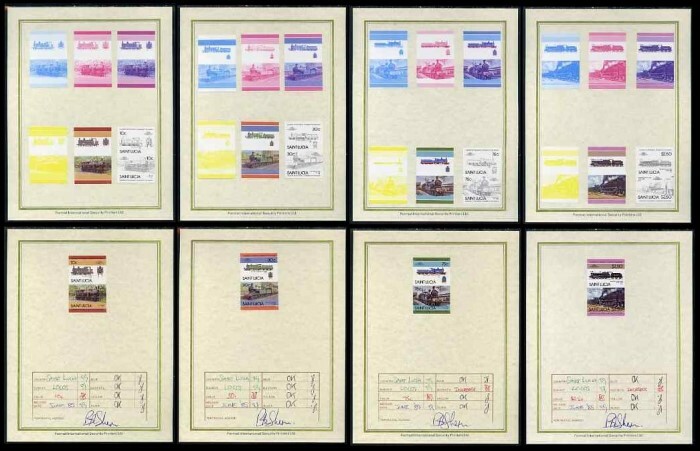 I have created a special page with tables of links showing examples of the various progressive panes used to create the stamps including some of the made for collector errors. 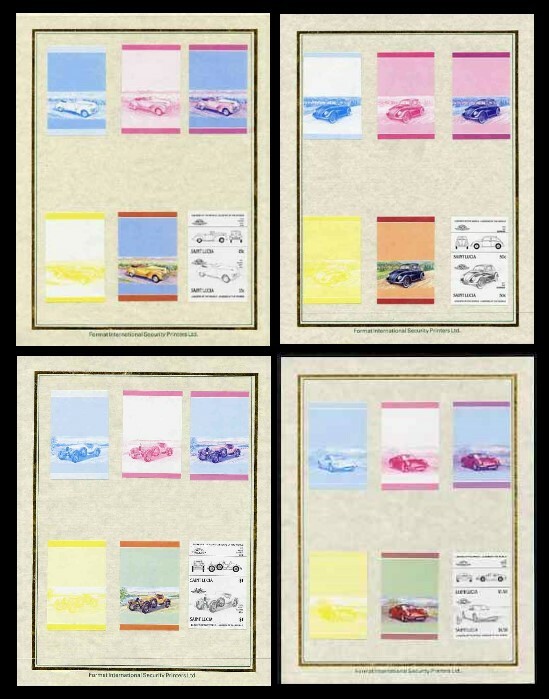 The links will take you to pages showing the progressive color proof panes and a closeup image of specific values from the different series to help collectors define which proof belongs to which series and value. 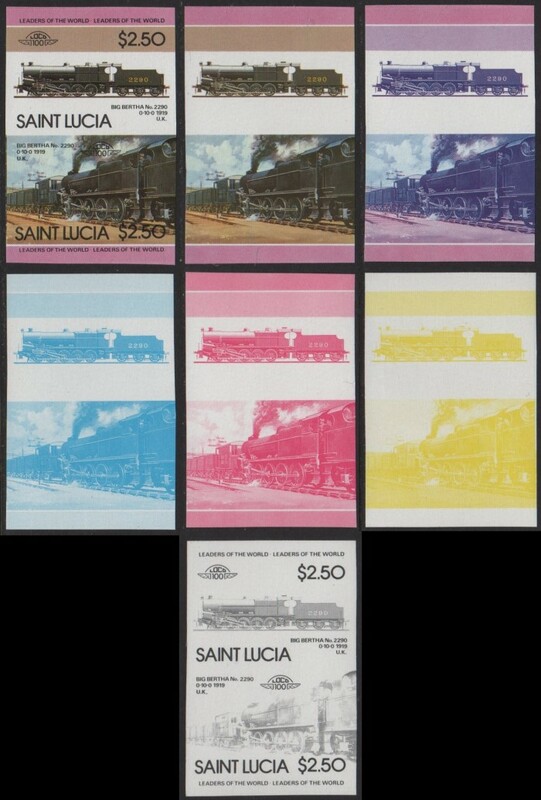 View the SPECIALIZED Saint Lucia Leaders of the World Automobiles and Locomotives Progressive Color Proofs Page here. Dangerous modern fakes of this issue appearing first in 2016 are on the market. They have the correct perf size! Visit the linked page to define all of them and what to avoid. So far, perforated and imperforates have been forged. 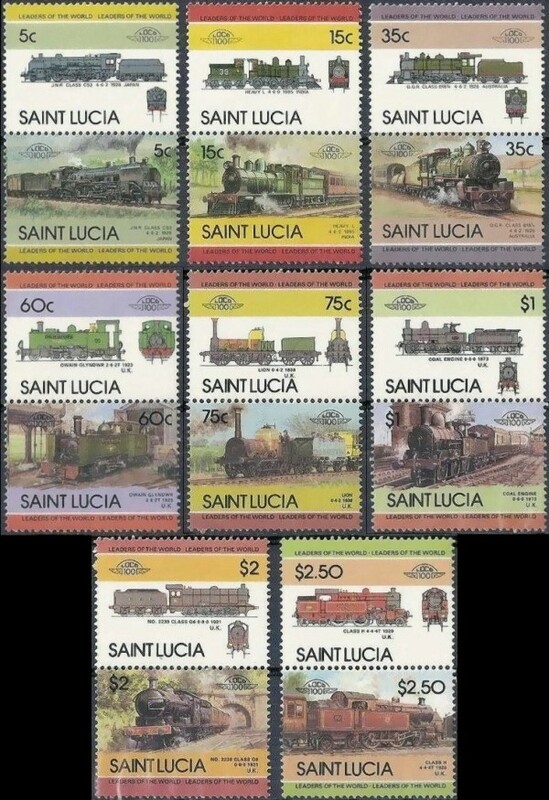 The Newly Discovered 1st Series Locomotives Forgeries. 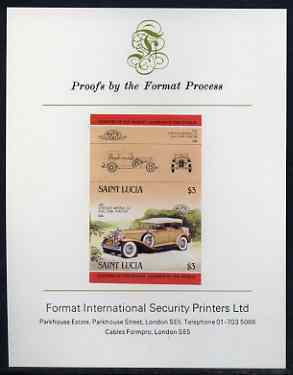 The number of proof presentation cards that exist is unknown but should be considered rarer in this form than off card. 3,000 progressive color proof sets produced according to general original printing practices. 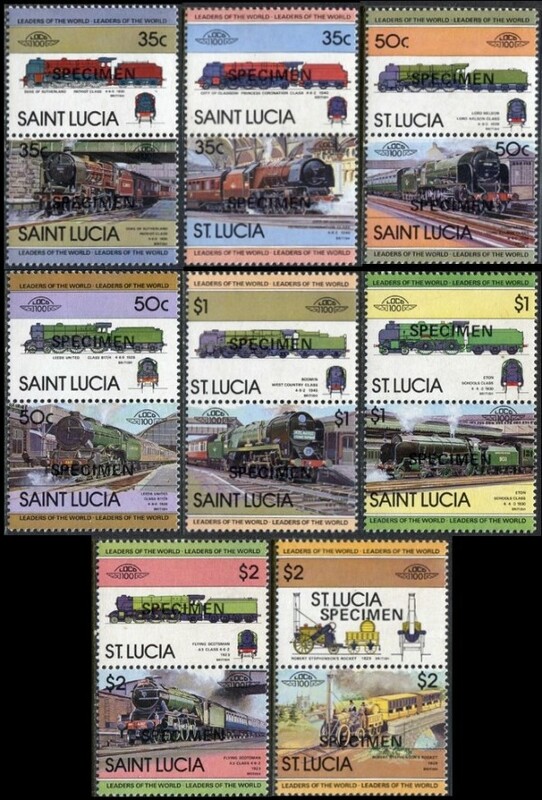 At present there is no evidence that any other varieties exist for the 1st Locomotives series. At this time, no imperforate specimen overprinted stamps nor error stamps are available on the market. 5,000 imperforate sets produced according to general reprinting practices. 3,000 progressive color proof sets produced according to general printing practices. 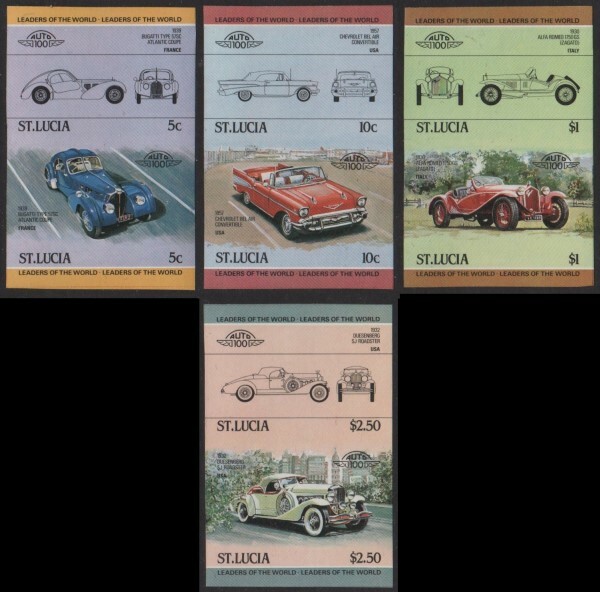 At present there is no evidence that any other varieties exist for the 1st Automobiles series. At this time, no imperforate specimen overprinted stamps nor errors are available on the market. 5,000 imperforate sets produced as limited printing according to general reprinting practices. At this point several values seem not to exist in this form. Possibly destroyed by waterdamage. Still under research. The number of proof presentation cards that exist is unknown but should be considered rarer in this form than off card. Some values appear to not exist. Again possibly destroyed by waterdamage. Still under research. It appears that the progressive color proof panes were destroyed for this set by waterdamage. As shown all values do exist on presentation cards in folders. The number that still exists is unknown but they can be considered quite rare. 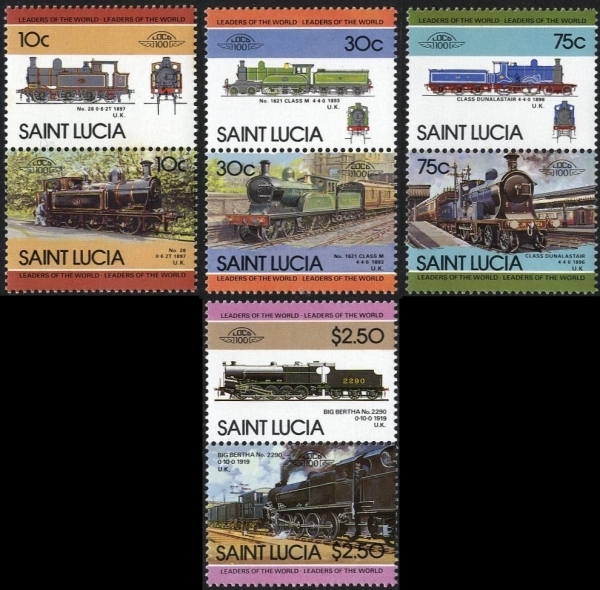 At present there is no evidence that any other varieties exist for the 2nd Locomotives series. It is probable that they were produced but they are probably destroyed. At this time, no imperforate specimen overprinted stamps, error stamps nor progressives color proofs (other than on cards) are available on the market. 5,000 imperforate sets produced according to general reprinting practices. Four values imaged. All values exist but it is unknown if all 5,000 of each value still exists. The number of proof presentation cards that exist is unknown but should be considered rarer in this form than off card. Only the four high values are available in this form. 3,000 progressive color proof sets produced according to general printing practices. Evidence is pointing toward the possibility that the four lower values of progressive color proof packs were destroyed probably by waterdamage. 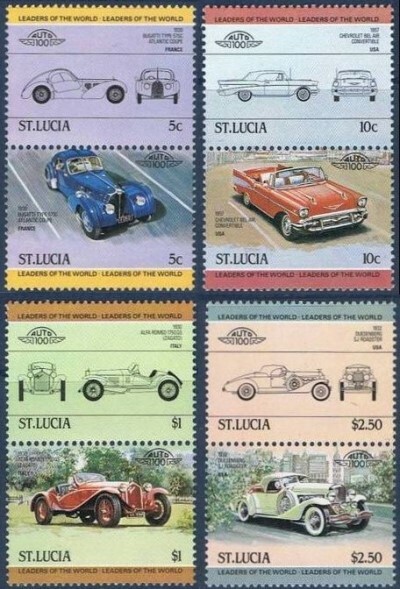 At present there is no evidence that any other varieties exist for the 2nd Automobiles series. At this time, no imperforate specimen overprinted stamps, progressive color proofs (other than the four high values) nor errors are available on the market. 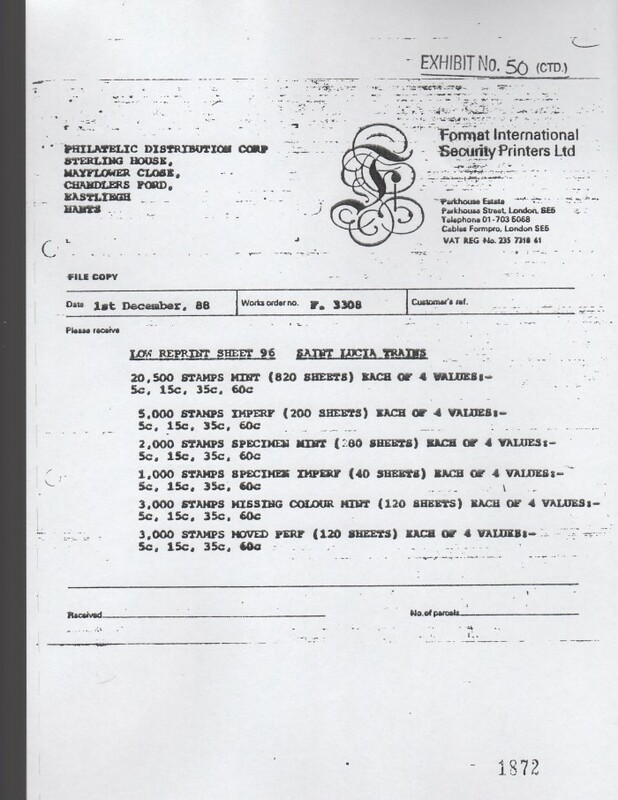 2,000 specimen overprinted sets produced according to the reprint invoice. 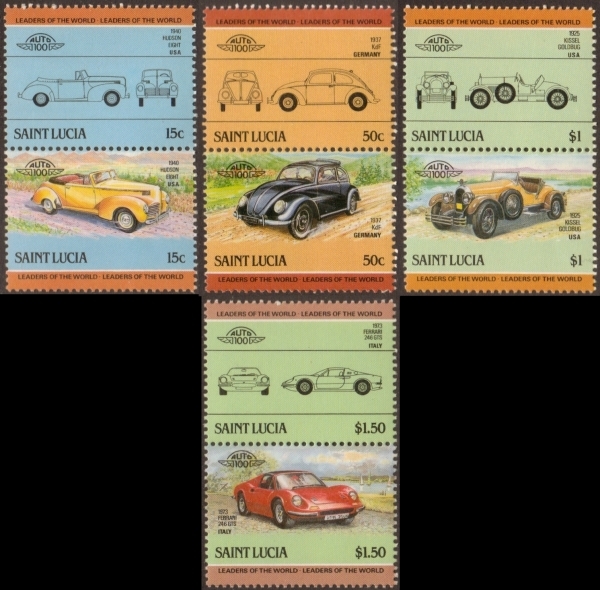 No imperforate specimen overprinted sets seen on the market. 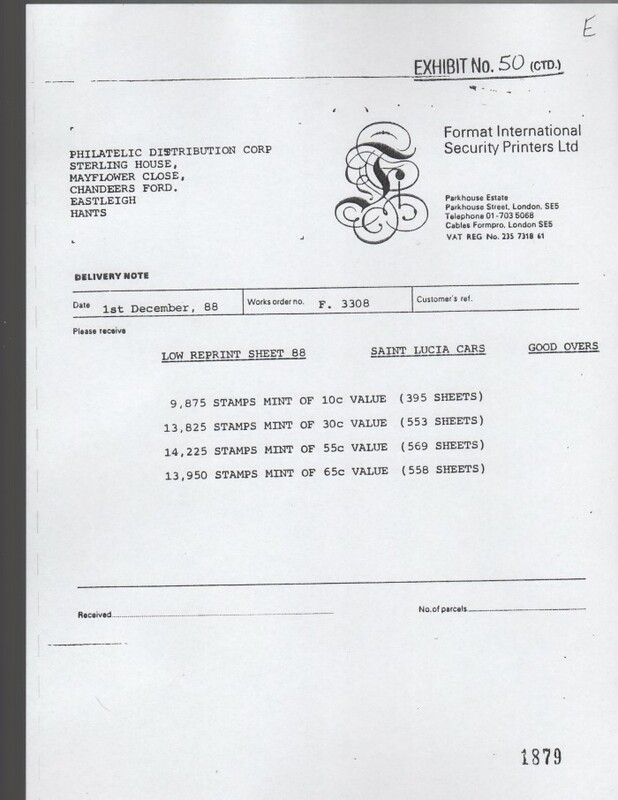 5,000 imperforate sets produced as limited printing according to the reprint invoice. At this point some values seem not to exist in this form. Possibly destroyed by waterdamage. It is said that only 10 exist of the imaged stamps. Due the reputation of the seller, I doubt this to be true. 3,000 progressive color proof sets produced according to the general printing practices. At this point some values seem not to exist in this form. Possibly destroyed by waterdamage. It is said that only 10 exist of the imaged stamps. Other values of the series are also being offered under the same assumption. Once again, due to the reputation of the seller, I doubt this to be true. 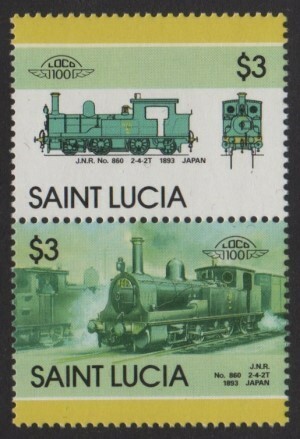 At present there is no evidence that any other varieties exist for the 3rd Locomotives series. It is known that they were produced but at present unknown as to quantities that exist. At this time, few imperforate stamps, imperforate specimen overprinted stamps nor progressive color proofs (other than values sold by a single seller on ebay) nor error stamps are available on the market. 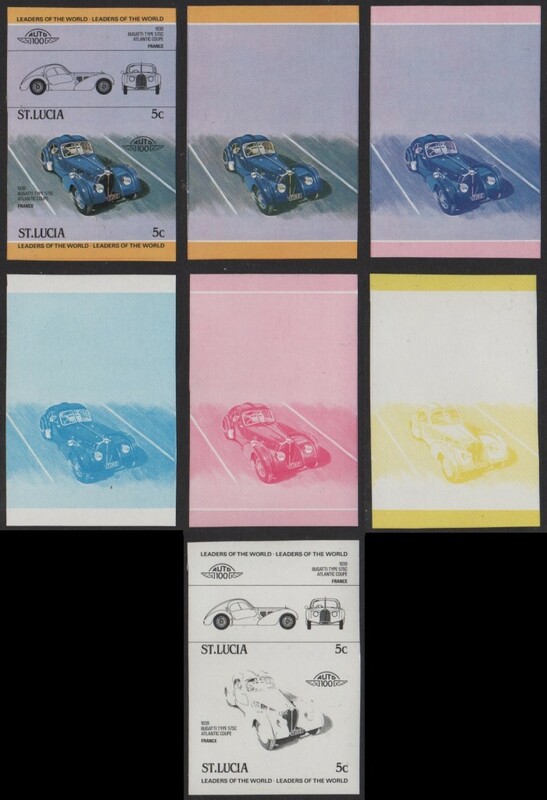 The number of progressive color proof presentation cards that exist is unknown. The progressive color proofs themselves cannot be found. Probably destroyed by water damage. At present there is no evidence that any other varieties exist for the 3rd Automobiles series. At this time, no specimen overprinted stamps, progressive color proofs (except on presentation cards) nor errors are available on the market. 5,000 imperforate sets produced as limited printing according to general reprinting practices. The number of proof presentation cards that exist is unknown but should be considered rarer in this form than off card. All values exist on card. 3,000 progressive color proof sets produced according to general printing practices. All values exist this way. The number of proof presentation cards that exist is unknown. They can be considered very low in numbers thus putting them in the category of rare. At present there is no evidence that any other varieties exist for the 4th Locomotive series. 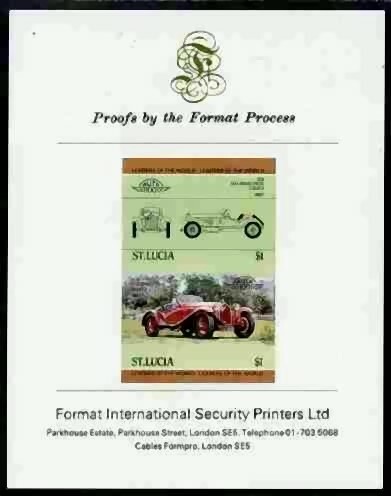 Dangerous modern forgeries of this issue appearing first in 2014 are on the market. Perforated forgeries of this issue are on the market! 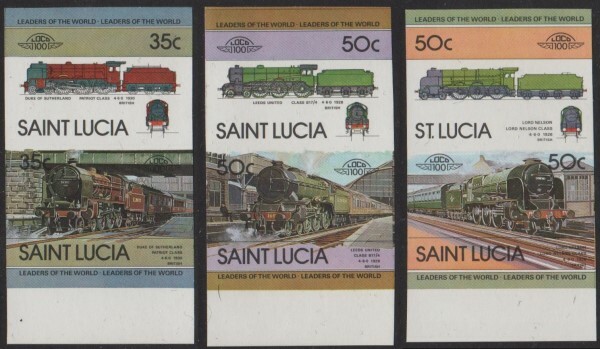 The Saint Lucia 1986 Leaders of the World Locamotives 5th Series Stamp Forgeries. I have found that the the 5c, 15c, 30c and 60c values exist with the missing yellow error. Also the $3.00 value exists with missing red error. 3,000 error stamps produced according to general reprinting practices. It is unknown how many still exist. 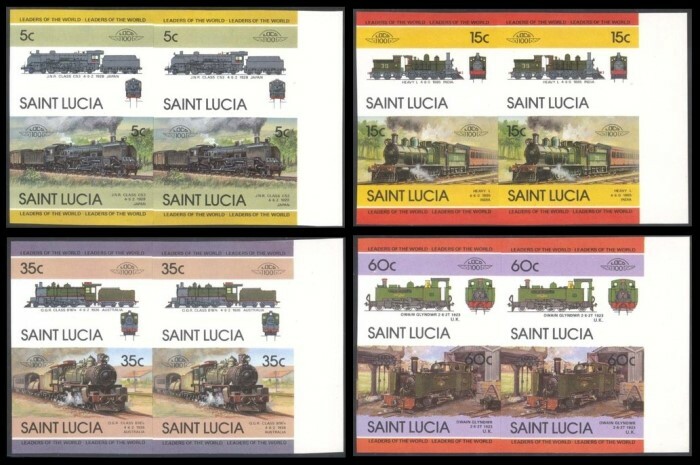 At present there is no evidence that any other varieties exist for the 5th Locomotive series. At this time, no imperforate specimen overprinted stamps nor any other error stamps are available on the market. The Newly Discovered 4th Series Automobiles Forgeries. 75,000 sets of normal perforated issues were produced. We predict that this figure may be inaccurate as since there are no varieties available it is possible that a second printing of the normal issues may also not exist. Appears no varieties at all are available for this set. Perhaps they were to near the water and were completely destroyed? If not hopefully this page will bring them to light as more and more visit it. We shall see. 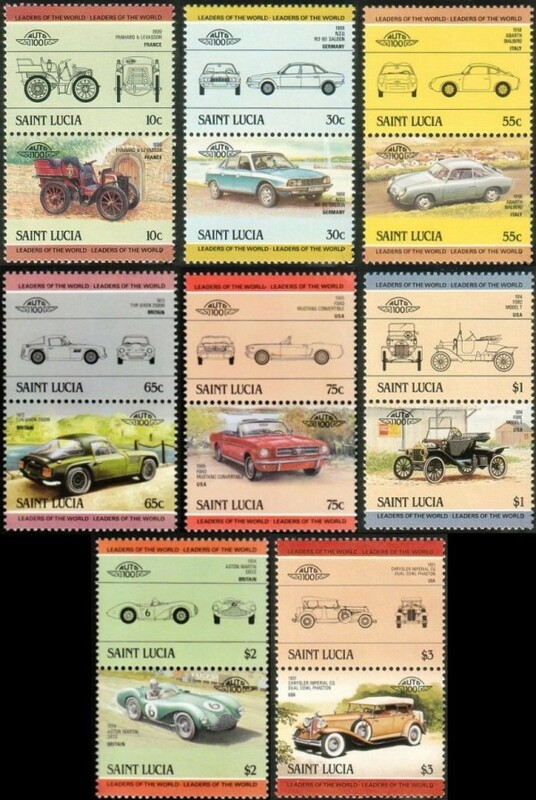 This concludes or study of the varieties produced for the Leaders of the World Automobiles and Locomotives series issued by Saint Lucia. We hope that this clarifies the point that the stigma that millions were made of each issue is completely false and should be ignored by collectors and dealers of these issues. 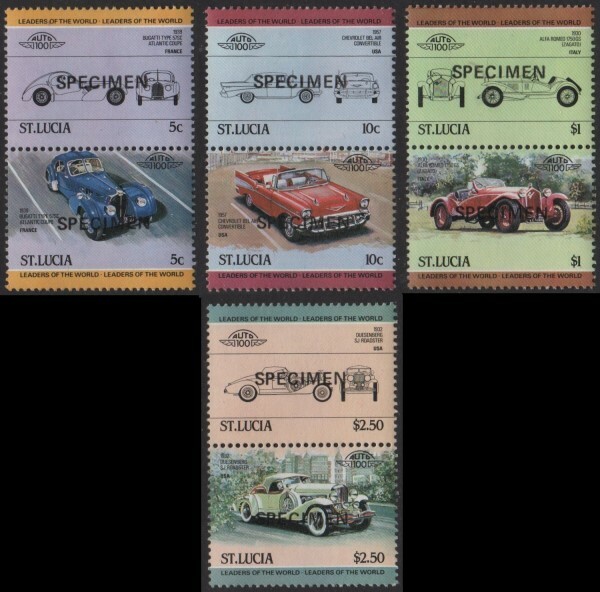 Because of a few biased and exaggerated opinions and written articles on these issues of which they have no evidence to back their claims the LOW stamp issues and varieties have been undervalued and shunned by many for years. Sometimes the "experts" are not such experts as they have not completed the research needed to verify their claims. I have and this is for you.